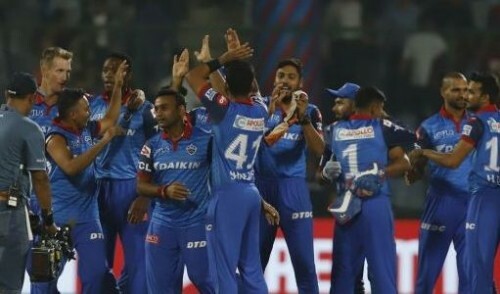 New Delhi : It was the perfect advertisement for T20 cricket as Delhi Capitals (DC) beat Kolkata Knight Riders (KKR) by three runs in the Super Over after the match ended in a tie at the Feroz Shah Kotla on Saturday. Chasing 186, DC finished on 185/6 as the crowd witnessed some high-quality action. Batting first in the Super Over, Delhi managed just 10/1 with Prasidh Krishna bowling a tight line. In reply, KKR lost Andre Russell for just 4 as Kagiso Rabada bowled a perfect yorker. He followed it up with a few perfect deliveries to defend the total and win the game for Delhi. Needing to defend six runs off the final over of the innings, Kuldeep Yadav showed nerves of steel as the Delhi batsmen failed to score them on a Kotla wicket turning square. With 2 required off the last ball, Colin Ingram was run out while completing the second run. Even though the game ended in a tie, it was a case of quality batsmanship on display as Russell first showed what brute power is during his knock of 62 off 28 balls (4x4, 6x6) before Shaw followed it up with a classy 55-ball 99 (4x12, 6x3). Chasing 186 on a Kotla wicket was never going to be easy, but Shaw and skipper Shreyas Iyer (43) put on 89 runs for the second wicket to set the platform for Delhi. If Shaw was the perfect mix of some orthodox and unorthodox style of hitting, Iyer was more than happy to play the second fiddle. But the duo were severe on any bad ball and took special liking for chinaman Kuldeep as they smashed him for 33 off his first two overs. Although Shubman Gill gifted Iyer a life on 35, he couldn't make much of it as the same fielder caught him off Russell for 43 two balls later. After that it was Rishabh Pant's turn to join the party for Delhi. But the southpaw managed just 11 as Kuldeep dismissed him with DC still needing another 16 runs. There was no celebration in the KKR ranks as the match looked very much in the bag for Delhi. Kuldeep dropped Shaw (97) off the very next ball as it turned out to be an unlucky day for the spinner. Shaw was dismissed in the next over by Lockie Ferguson as Dinesh Karthik completed a good catch. This changed the complexion of the match completely. Ingram and Hanuma Vihari were at the crease to face the last 6 balls but Vihari (2) was dismissed by Kuldeep with DC needing 2 off 2 balls. Earlier, Iyer won the toss and decided to bowl. It all looked good before Russell came into bat in the 10th over of the KKR innings. With the score reading 61/5, it looked like DC had the game under control. But Russell had other ideas. After being hit on the shoulder by a Harshal Patel bouncer in the 14th over, Russell had his revenge in the 16th over when he clobbered the Patel for two humongous sixes to set the stage for a flourishing end to the KKR innings. Skipper Dinesh Karthik (50) gave him perfect company as the two put up 95 runs for the sixth wicket off just 53 balls. The DC bowlers completely lost the plot after putting up a brilliant show in the first 10 overs. Kolkata picked up 121 runs in the last 10, with 67 coming in the last 5 overs. Russell was finally caught by substitute fielder Rahul Tewatia off Chris Morris in the 18th over while Karthik was dismissed by Amit Mishra in the next over, caught by Rishabh Pant. A sluggish pitch in the first innings ensured that the Kolkata batsmen failed to turn on the heat on the Delhi bowling unit at the top of the innings. DC had made three changes with Harshal Patel, Sandeep Lamichhane and Chris Morris coming in for Ishant Sharma, Rahul Tewatia and Axar Patel. Nikhil Naik was the first one to go when ge missed a straight one from Lamichhane for just 7. He even wasted a review when the dismissal looked plumb. With the score reading 16/1, Robin Uthappa joined Chris Lynn in the middle. Uthappa and Lynn tried their best to improve the scoring rate, but Patel trapped Uthappa (11) in front with the score reading 36/2 in the 6th over. This was just the beginning as wickets kept falling at regular intervals. KKR soon lost Lynn (20) after Rishabh Pant took a brilliant catch down the leg-side off Kagiso Rabada. The scoreboard read 40/3 at this stage. In-form Nitish Rana (1) was also dismissed trying to up the ante as he hit Patel straight to Rabada at fine-leg. But the worst dismissal had to be Shubman Gill's who was run out ball watching. With the scoreboard reading 61/5, Russell joined skipper Karthik in the middle in the 10th over. After that, it was all about the Russell show till Morris dismissed him in the 18th over. Kolkata Knight Riders: 185/8 in 20 overs (Andre Russell 62, Dinesh Karthik 50; Harshal Patel 2/40) beat Delhi Capitals 185/6 in 20 overs (Prithvi Shaw 99, Shreyas Iyer 43; Kuldeep Yadav 2/41) in Super Over.